We are all connected. Beginning our developer’s path, we more or less consciously sign a social contract with the community that’s based on sharing. Sharing, not only of code, but first and foremost knowledge is the foundation of the Open Source movement. Twenty years after it all began is a perfect timing to pay our debt. The Free Elixir Course by Prograils is our way to say ‘thank you’. This is not the first time we felt obliged to express our gratitude to the Open Source community by submitting something way more useful than a lengthy blog post. Some time ago, we have posted our Online SaaS Course which shows you how to create your first Rails app. Now, it's time to go a step, if not many, further. 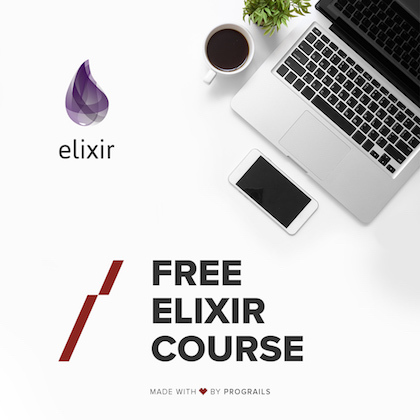 Comprising eleven major sections, some divided into smaller chapters, the Free Elixir Course is written for everyone who has some basic understanding of programming. If then you are a total carte blanche in terms of programming experience, do your homework first and come back later. If you already possess the basics and/or have previously programmed in any other language - you are in a good position to expand. scalability, that is the capability of a system to handle a growing number of operations, which makes it a superior choice for high-traffic systems. The good news is that Elixir shares several syntax similarities with Ruby and there is a heavily Rails-influenced web application framework - Phoenix, which - according to benchmarks - greatly exceeds RoR in terms of performance. What might also speak well of Elixir is the fact that it stems from Erlang, a 1986-born language used by the telecom industry and govtech. Both sectors aim at ensuring the fundamental technology services to everyone and can hardly afford any downtime due to maintenance works. Although Elixir is a relatively new language (2011), its benefits have been widely known in the programming community and already recognized by giants like Netflix, Discord and Pinterest. All of them have significantly improved the performance of their services. What's more, the switch to Elixir resulted in serious code amount cuts as well as reduction of server infrastructure required. All these factors saved these companies lots of money. The list is growing and so it is predicted in regards to the demand for developers with Elixir skills, since it simply matches the tech industry’s growing needs. So, yes, if you want to shine among other devs, what are you waiting for? Take this opportunity and start our Free Elixir Course. Bon voyage!